Plato would have had a field day with Los Angeles at this point in time. Even the term Virtual Reality has Platonic connotations. After all, Platonic Realism espouses the notion that the material world is only a poor copy of the real one. In his allegory of the caves, Plato described shadows which people assume are real, but are, in fact, mere imitations of the real world. What would Plato have thought of social media, with all its filters used to create a hyper-perfect reality? What is real, and what is a façade? Even the entertainment world in Los Angeles, and the dark underbelly that was exposed this year. Beyond the glossy images on the silver screen, the hair and makeup, the movie sets, sexual assaults had been swept under the rug in an attempt to maintain optical illusions peddled for public consumption. Caves and shadows exist in Los Angeles, and they are real. Plato would have enjoyed Plato in LA: Contemporary Artists’ Visions, an innovative exhibit at the Getty Villa brilliantly curated by Donatien Grau. The exhibition includes work by artists Paul Chan, Rachel Harrison, Huang Yong Ping, Jeff Koons, Josephy Kosuth, Mike Kelley, Paul Mc Carthy, Whitney McVeigh, Raymond Pettibon, Adrian Piper, and Michelangelo Pistoletto. Jeff Koons’ “Play-Doh” is a showstopper. The link to Plato goes beyond whimsical word play. Dr. Grau connected Koons’ work with Plato through the concept of democratization. There is really no more democratic art medium than Play-Doh (although it is technically made from Polychromed Aluminum). Although it is contemporary art, Koons revealed that the polyrchromed aluminum will endure for centuries, linking it with the enduring antiquities in the other galleries at the Getty Villa. Jeff Koons. American, born 1955. Polychromed Aluminum. Object: H: 315 X W 386.7 X D: 348cm. © Jeff Koons. VEX. 2018.1.9. Another work not to be missed is Huang Yong Ping’s “Caverne 2009.” This work references Plato’s Allegory of the Cave. What makes it unforgettable is the allusion to the Taliban’s destruction of the largest Buddhist statues in the world. This powerful work leads us to the most Platonic of acts- contemplation- and reflection on how such destruction transpired and achieve a sense of healing through art itself. Platonic metaphysics leads us to ponder not only the world that is, but also the world that can be. In today’s world, full of tragedy and violence, Plato and art, can guide us to envision better horizons. If there is only ONE artistic experience in which you engage this week, run, don’t walk (Uber- whatever you need to do to GET there!) to Christie’s Beverly Hills. To say the viewing is a high-octane experience is an understatement. The first clue that you are in the room with works from the highest stratosphere is when you see the plethora of Men In Black with secret-service earpieces guarding the masterpieces. All of these works hail from the collection of Peggy and David Rockefeller and will be heading to New York to the Rockefeller Center (naturally!) for what may be the greatest art auction of all time- the work is valued at 500 million. What is even more extraordinary is that all of the auction proceeds will benefit charity. So many treasures in one room. Edward Hopper is often known for scenes of gritty urban loneliness like Nighthawks, Nightwindows, and Morning in the City. The Hopper painting in the Rockefeller collection could not be any more different. This uplifting, captivating view of Cape Ann,, coaxing the viewer on a stroll through northeastern Massachusetts, although it could just as easily be the moors of the Brontes. Despite their great wealth, the Rockefellers many homes- in Hudson Valley, the Upper East Side, Mount Desert Island, St. Bart’s, and Columbia County have been described as neither ostentation nor imposing, but warm and inviting. Standing in front of this soothing Hopper, one can only imagine it hanging in one of their homes, creating an aura of tranquility. When you look at the placard next to this painting, the price says “Estimate on Request.” This is like perusing one of the most expensive items on a restaurant menu- except this is not a Lobster, but a feast for the senses with a potential market value over $90 million. What is incredible is that it was first purchased by Leo Stein for $30. And Gertrude Stein was furious with him for purchasing it! Don’t miss a suite of Peridot and Diamond Jewelry, by Van Cleef and Arpels. The necklace, which looks coronation-worthy, is intriguing in that if you look closely, the different elements can be removed and taken apart, to create, for instance, a broach. Who will be the buyers of these stunning works? We will all be waiting with bated breath for the moment when the auction gavel will launch for this collection. Until then, head to Christie’s for a historic art-viewing opportunity that may never repeat itself again. Fasten your artistic seat belts. The Getty Center’s “Beyond the Nile: Egypt and the Classical World” is truly a blockbuster show, spanning more than 2000 years and covering geography ranging from Minoan Crete, Hadrian’s Rome, and Ancient Egypt. What is inspiring about the exhibit is that the civilizations of Egypt, Rome, and Greece are not viewed as separate entities. In fact, the exhibit’s main theme explores the influence that these cultures had one another. Egypt’s impact went beyond the Nile, and its presence can be seen in the Classical world’s frescoes, coins, sculpture, and pottery in an enriching exploration of artistic cross-pollination during antiquity. And there is nothing that Cultural Cocktail Hour enjoys more than a magnificent fusion. It underscores the fact that as human beings, we have more that unites us than separates us. Art is a lens that can depict the thriving connection between distinct cultures. 1. A TRULY GLOBAL ENDEAVOR Of the more than 300 works on display, surprisingly only 3 (!) come from the Getty’s collection. Getty Museum Director Timothy Potts revealed that the rest hail from a vast array of museums around the globe, including the British Museum, the Louvre, The National Archaeological Museum of Naples, and the Berlin State Museum. 2. “SCULPT LIKE AN EGYPTIAN” : Senior Curator Jeffrey Spier revealed that Ancient Greek sculpture was heavily influence by Egyptians. The Greeks did not carve stone sculpture prior to the seventh century B.C. But after seeing Egyptian images, the Greeks began creating Kouroi (figures of young men) and Korai (Figures of young women). When observing these Greek sculptures, look for clenched hands held tightly at the sides, the visual links to the Egyptian sources of inspiration. 1st Century B.C-1st Century A.D. Roman. “BEYOND THE NILE” warrants several visits to take in the manifold objects spanning countries and centuries. found in Benevento, Italy. This Roman-Egyptian obelisk honors the Emperor Domitian and the Goddess Isis. The obelisk sets the tone for what one will view inside. Isis was a significant goddess in Ancient Egypt, but her popularity transcended the land of the Nile. The Greeks viewed her as manifestation of Aphrodite, and she also gained a cult following in Rome. So, this first piece heralds the notion of cultural fluidity that will be a cornerstone of the exhibit. The intricately designed staircase leading to the exhibit is just one of many creative details at the exhibit. This transportive staircase allows one to travel back in time with majestic flair, robes fluttering in the LA breeze, like Egyptian deities. One feels like a pharaoh and can unleash one’s inner goddess. This is a key figure to recognize! You will see his image throughout the exhibit. In fact, when Ptolemy 1 became the king of Egypt in 305 MC, he elevated Alexander the Great to god-like status with a cult that deified the conquering hero. Some visual clues to Alexander’s portraiture: the leonine hair with curls raised above the forehead and youthful mien. (After all, Alexander created one of the largest empires ever before he reached the ripe old age of 30. Not too shabby). #4. CUP WITH EGYPTIAN SCENES Roman 25 BC- AD 79; found in Stabiae, Italy. Obsidian with pink and white coral, carnelian, jasper, lapis lazuli, and malachite framed in gold. This cup captivated the attention of many museum goers at the Getty during my visit; I observed them transfixed by this glowing cup, as they walked around to capture the various angles as light streamed through the obsidian glass. The luster of the glass stems from its origin as black volcanic glass. Its mesmerizing property extends to the colorful semiprecious stones which depict Egyptian scenes, including the sacred Apis bull and Horus falcons. Other symbols include a solar disk with two royal cobras known as uraei. This Mosaic is also not to be missed. Restored by the Getty, it was originally part of an immense floor mosaic nearly twenty feet long. Thus, the level of detail on this mosaic is breathtaking. Again, the confluence of cultures is evident in this piece which was discovered in present-day Palestrina, east of Rome, yet depicts an Egyptian scene: an Egyptian steers a boat on the Nile, where a festive group is serenaded by musicians. Incidentally, the depiction of the Nile on the original piece extended from Ethiopia in the South to the Egyptian delta on the Mediterranean coast. Some celebrate BACH’s BIRTHDAY on March 21st, some on March 31st (due to the differences in the Gregorian and the Julian calendar). We here at Cultural Cocktail Hour celebrate BACH’s BIRTHDAY all month long! Did J.S Bach, the eminent composer of such celestial works as the Goldberg Variations, the Well-Tempered Clavier, the Brandenberg concertos, and the Toccata and Fugue in D Minor have an alter ego? It appears that the clever Kapellmeister, director of heavenly choirs, and the composer of music divine, may have had a mischievous streak. 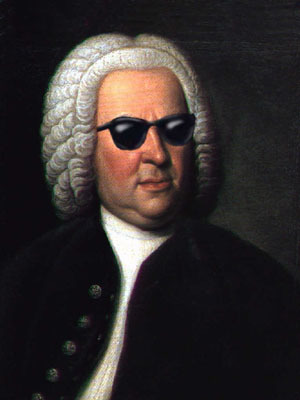 As choir director in Arnsadt, the 20-year old Bach got into fisticuffs with a student named Johann Geyersbach. He then called Bach a “dirty dog” and Bach drew his sword. The two began wrestling until other students tore them apart. The nanny goat case was taken to court. The court found Bach guilty of having called Geyersbach “Zippelfagottist,” a nanny goat bassoonist. They told him that a man must learn to accept the less talented. Did Bach take the court’s advice to heart? A few years later he tore of his wig and hurled it at a musician, telling him he should have gone into cobble making. Overall, Bach did a good job of hiding his Hyde. Where there is smoke, there is fire. With the embers of genius burning in his brain, it is only natural that Bach had to let off a little steam. If the cost of brilliant intensity is a tossed wig and a nanny-goat epithet, they are minor ducats compared to eternal treasures. Is an opera singer allowed to smile? In 2011 critics blasted Anna Nebtreko, star of Donizetti’s Anna Bolena for daring to smile on opening night at the Metropolitan Opera. The audience wildly cheered Ms. Netrebko after a particularly grueling and moving rendition of the aria Al dolce guidami. Netrebko, who had been gazing upward, briefly smiled, causing the audience to erupt in more cheers. The critics lambasted her for this gesture, which they claim caused her to break character. Their negative reaction begs the question: for whom are singers performing: naysaying critics or their beloved audience? What about the bond between a singer and the audience? 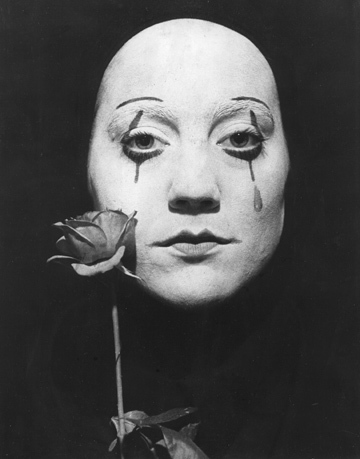 Opera celebrates the wide gamut of human emotions. Why should should natural feelings and spontaneous impulses be constrained? When a singer is not allowed to acknowledge the connection with their audience or their own emotional triumph, that is a shame. The critics should realize that one can have vibrant fonts of human emotions or one can have statues. This photo represents a facial composite of that 21 year old wunderkind Mozart, created in the around 1990s by the Bundeskriminalamt Wiesbaden—the Federal Criminal Police Office of Wiesbaden, Germany—from four portraits painted during the composer’s lifetime, according to the website Dangerous Minds. Would you trust this guy with a Sonata? Incidentally, Mozart found forgiveness for one of the few “illegal” activities in which he found himself embroiled. As a 14 year old, he created the first illegal copy of “Misere,” a piece heavily protected by the Vatican. Even copying the piece from memory (as Mozart did) was punishable by excommunication. However, when the Pope met the young prodigy, instead of scolding him, he lavished the youngster with high praise.